Lets put a new offer for a New Year! All Mishimoto products are now in sale including fans, clamps and radiators. Mishimoto product range got a little bigger after we added some model specific cooler and exhaust kits. Mishimoto radiator is a model specific and high quality manufactured peace of art which is a great for replacing the original radiator. Mishimoto radiator is a much more effective and excellent compromise for any engine - no more cooling problems (not even in traffic lights). Mishimoto has a bigger water capacity and it keeps the coolant nice and cool in every condition, whether it's driven in street or track. If there is not a suitable radiator in the model specific listing, we have made a dimension pdf. where its possible to check the correct one with dimensions. Most popular products are in our own stock. Mishimoto cooler keeps the intake air always cool! The cooler the air is, the more air can be confined to te engine - temperature rises without volume increases. When you change the original cooler to the Mishimoto one, air cools much better and faster. You can find a suitable intercooler with dimensions and we have also listed some model specific kits as well. Most common cooler are in our stock. Mishimoto fans ensures just the correct air flow for any setups. There is many different sizes available, for example 8, 10, 12 and 16" ones. Electric fan is also excellent with the original mechanic fan, for example in traffic jam or some racing conditions. For a bigger cooling needs, we recommend the Race Line series which has enough power to keep even the biggest engine cool. Most popular fan models are in our stock and we order more always when needed. Mishimoto has some exhaust available also, especially for newer cars. Kits are model specific and are available for example for Ford and Subaru. Exhaust kit includes the model specific downpipe, flanges, clamps and its possible to choose it with or without a catalyst. Exhaust kits are in Europe stock and delivery time is usually only under a week, so these can be delivered very fast. In addition to the previous ones Mishimoto makes a high quality silicone hoses, catch cans, thermostats and clamps. Big part of installation parts and other hardware can be found directly from our warehouse like silicone hoses and clamps in most sizes. 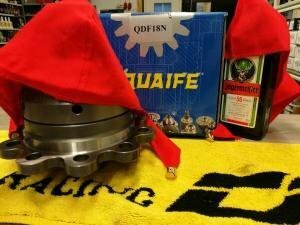 Lets put high quality and popular Holset HX35 turbochargers in sale. More specifically we put the HX35 12cm2 and HX35 Super 8cm2 (oil/water cooled) models in discount. We just put a discount on Holset HX35 turbochargers and more specifically HX35 12cm2 and HX35 Super 8cm2 models. The Holset HX35 Super 8cm2 "wakes up" comfortably from lower rounds and can be always twisted to the end. The 8cm2 housing fits nicely to 1.6 - 2.0l engines and for larger assemblies we recommend the HX35 12cm2, which is suitable even a little bit larger engine. Holset superchargers are available in both: Water and oil cooled models (HX35 Super), both have their own advantages: Oil may be a bit easier to install, but water usually provides a slightly more efficient cooling. Holset turbochargers are always shipped with a model specific gasket kit, which means you don't need to buy them separately, unless the purpose is to grab a few pieces for the future. For more information and assistance in selecting turbochargers, please contact us by e-mail or phone. Most popular turbochargers can be found directly from our stock. Rota wheels now in our webshop! This week, Rota wheels was added in our webshop with product descriptions and model specific pictures. Rota is one of the leading brands in the market and you can find just the right wheels almost for any car. Rotas wheel range covers a wide range of rims, basic 5-spoke models or more rigid models designed especially for off-road use. Rota alloy wheels are available in different bolt patterns, colors, offsets and widths. Spigot rings, center caps and nuts/bolts are always included in the shipment for free. Yesterday, the wheels selector was released which make searching the wheels much easier, especially if you have bolt pattern, offset and/or width in mind. With wheel selector its possible to check only with wheel brand, but because of the large amount of wheels in the webshop, filtering for example with bolt pattern can be quite smart. The wheel selector is now in beta stage, but will be announced officially in no time - we recommend testing! Wheel selector is now officially out! The wheel selector is now officially available from our webshop, which makes it easy to find the correct wheels. Just select the desired diameter, pcd, width and/or offset and it will show all the wheels available with chosen specs. Wheels selector makes it easy to find the correct wheels as almost 150 wheel articles searched by hand is pretty laborious, especially when you know the specs. Of course its possible to check the wheels like before from articles or brands (its also possible with the wheel selector) - its your choice! We just got a nice batch of Davies Craig electric water pumps more in stock. We took more especially 150l/min and 115l/min models. With Davies Craig electric water pump you can get more power and trust in the cooling system, its possible to use it with the original water pump as a booster or use only the electric pump, either way is fine! There is pumps available between 15-150l/min, smallest ones are with nylon body and biggest models with more durable aluminium body, which is actually a really great thing in bigger flowing rates. Its possible to buy only the water pump it self or as a set which includes the controller. With controller its you can adjust the water flow and even a fan if needed, for example you can adjust the pump to stay on for a certain time after the engine has been switched off. Most common pumps like 115l, 130l and 150l are usually in stock and as said, we got a new batch of these in this morning. With D2, Eibach and H&R adjustable suspension kit you will get the suspension in shape. We can deliver all the kits fast and most popular models we keep usually in our own stock. All the three brands has a suitable suspension kit for most common and not so common cars, for example D2 coilover kits has a stiffness adjustment with height adjustment which makes it easy to make the kit perfect for any conditions. Eibach Pro-street S kits are excellent choices especially for street use when you need a height adjustable kit which is also very comfortable. H&R Twintube and Monotube suspension kits has almost same adjust specs, but Monotube has a different shock absorber type (upside-down) which makes it great also for race use. H&R Twintube is great mainly for street use and Monotube for race use (it also works great in a street car as a compromise). Eibach spacers makes the car look and feel much better with reasonable price. Widening the track makes the car more stable and it also gives much smoother look. Some of the most popular spacers and bolts/nuts are in our own stock. Its possible to look spacers by car model or with wheel specs, so basically if you know what car you are driving, then its easy to find the spacers as well. If the car is not known or it is not on the list for some reason, they can also be searched by bolt pattern, width or center bore and of course its possible to ask from us - thats why we are here. Spacers are priced as a pair and most of the thickest spacers comes with new bolts/nuts (depends which ones car uses). Of course it makes sense to buy new bolts/nuts for all new spacers, they are listed separately in our webshop. Aluminium spacers are also much lighter than steel spacers, but they has the same durability anyway. Some of the spacer models are in our or in our suppliers stock and we always try to keep the delivery times fast as possible - for example we offer express shipping from Eibach, which is usually only a few working days (in finland) to you door / nearest pickup point. We have listed all the most popular wheels which are also available in our webshop from both brands. Wheels travels very quickly from the factory and a set of spigot rings are also included for mounting. The range of Ultralite and XXR covers lots of different type of wheels, for example a 6 and 10-spoke models. There are several color options as well as different bolt patterns, offsets and widths, which you can choose by yourself. Both wheels brands are also supplied with spigot rings, making the installation much easier and safer. From us, you will find also Bilstein B14/B16 suspension kits and B8 shock absorbers. We have listed few most popular models in our webshop and you can ask suitable kit for your car from our sales. In this week, we listed few Bilstein B14/B16 adjustable suspension kits and also a couple Bilstein B8 sport shock absorbers. There are only couple of kits available in our webshop, but they are listed mainly to give approx prices and availabilites. 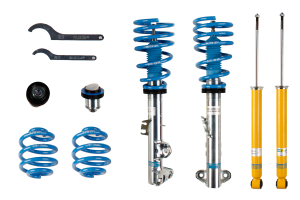 Bilstein B8 shock absorbers are little bit shorter that OEM shocks, so they are excellent for example with Eibach Pro-kit or Sportline lowering springs. Bilstein B14 and B16 kits are adjustable, lowering is between 30-50mm - B16 kits has also a 10 step damping adjustment for compression and rebound (biggest difference to B14 kit). Offer for Bilstein B14/B16 or B8 shocks can be asked from our sales, for example trough spare parts inquiry. Finding the correct suspension parts is now easier than ever! Just select your car's make, series and model, and the shop will show you all the model-specific parts available for it. The suspension search shows you all the model-specific kits in one view. Whether it's D2 coilovers, Eibach B12 Pro-Kits or B12 sportline suspension kits, or Eibach Pro-kit and Sportine lowering springs, they're all there. The model-specific listings make things quicker, and you see everything that's model-specific and available at a single glance. You can also narrow down the lists with the product brand and go deeper to just springs or coilovers. The shop also has several universal parts in the traditional product categories, like adjustable endlinks and coilover helper springs. Wheel selector helps a lot to find correct wheels. Just choose diameter, width, pcs and/or offset. In addition, the rims can also be filtered with different wheel brands. Wheels selector makes it easy to find the correct wheels as almost 150 wheel articles searched by hand is pretty laborious, especially when you know the details. Of course its possible to check the wheels like before from articles or brands. A lot of wheels and accessories (bolts and nuts) have recently been added to the webshop, for example we added all the Rota wheels and Japan Racing wheel amount doubled to the previous one. Spigot rings for the center bore always comes with all our wheel brands and with Rota wheels, nuts or bolts are also delivered in the package. Usually all the wheels are in european stock, so the delivery time has been under a week in best cases.